Outdoor cabinets accent the outdoor kitchen with functionality and formality. There is a host of outdoor cabinets to suit just about every grill and appliance out there. Outdoor cabinets expand the outdoor living space with convenience and comfort. They also serve a purpose in the formation of any outdoor kitchen design. The layout and design of cabinets can mold to any outdoor dining or entertaining intent. The stylish look of outdoor cabinets come in an array of materials such as marine grade stainless, high density polyethylene (HDPE), Perma tek, and powder coated in an array of colors and realistic wood grains. Outdoor cabinets offer an expansive array of door styles and handle pulls to match your home, hospitality and lifestyle perfectly. Things to look for are adaptability and survivorship against the formidable outdoors. Self closing doors and drawers. Easy cleaning and alignment. In our luxury outdoor kitchen design builds, almost always it includes a nice array of cabinets to define the space and support the appliance selection. 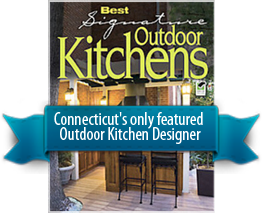 Outdoor kitchen cabinets help keep the outdoor kitchen prepared and organized. A self sustaining outdoor kitchen lessens the burden of bringing everything outdoors from inside. A good outdoor kitchen cabinet layout has a spot for everything outdoors.